The deep connection between complex event processing (CEP) and BPM has been the ongoing subject of both academic discussion and business innovation. In brief, CEP focuses on event analysis and correlation, while BPM focuses on business processes and their execution. 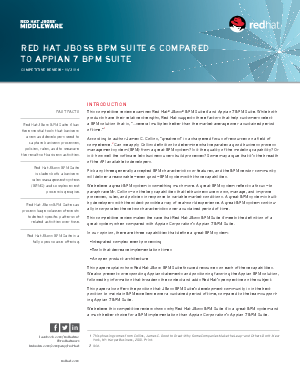 Download this paper now to find out how JBoss BPM Suite’s development community is in the best position to maintain BPM excellence over a sustained period of time, compared to the team supporting Appian 7 BPM Suite.